Spinify is a cloud-based staff motivation solution which enables users to automate incentive competitions to drive business-related activities and motivate staff using gamification. Managers can create competitions using any metric, by defining the target, participants, number of winners, and rewards, and selecting a theme from the included range. Employees take 3 selfies, representing different moods, and these pictures are used to identify them and [show] their performance within the games. Leaderboards can be accessed through the native iOS and Android apps, and can be displayed to the whole office using a TV. it is colourful and lively i esp like the fact that it is constantly entertaining and every time you look at it , the screen changes and looks different, this makes the atmosphere electric and lively. It almost makes the team feel like they are playing a game while they are working and also the fact that teams can see each other's progress on the screen rather than conventional methods like sending out an email periodically to the teams and the floor. the game like look and structure also helps to ease the pressure in the work place enviroment for example instead of the sobre emails and updates we are provided daily by the managers and the team leaders we can just look up at a screen that is there in front of us. it adds a great element of entertainment and drama and action to the floor whilst we work constantly at our desks and recieve boring email updates and sometimes even have to hold meetings to provide updates about each others teams. A good Manager/Team lead of a software company will let you in to the world of possibilities, where your ideas and thoughts are appreciated and converted in to reality in the means of software programs and give's you chance to contribute to the whole society.I really like the way this software give information about my team. I'd recommend. The Internet is the enabling technology that has transformed software into a delivered service. Indeed, the Internet makes it possible for enterprises to responsively access the latest version of software through a familiar browser interface on a transparently shared basis. Hosted services deliver the same level of software capability and performance as on-premise applications, but with centralized off-site management of application maintenance, upgrade management and infrastructure provisioning. Pricing is modeled as a subscription based on a metric reflecting usage. Relieved of the large upfront capital outlay and the ongoing drain of dedicating IT resources to software life-cycle management and customization, enterprises are gravitating toward this new view of software as a service. Experience has been great and they are very responsive, open to feedback, and continually making improvements. That's about all you can ask for.It's simplistic to set up and use from an administrator standpoint but also adaptable to give you what you need from a leaderboard standpoint. It's got some great features that allow you flexibility in what you're displaying and how it is being displayed. Their Customer Support is awesome and they continue to roll out new features. While that app itself is already great, I'm very encouraged by the idea that they seem to continually be improving it. Some of the features they roll out are very useful but things I didn't even know I wanted. I will say that we are not currently using Spinify in any fashion and have reverted to solely using our Salesforce Reports and tracking via Excel. Because of this, we have not kept up with whether or not Spinify is syncing correctly or not. I appreciate all of Spinify's effort to try to isolate the issue and understand that it could be any number of reasons, especially since our team is unique in our roles in utilizing Salesforce records as opposed to General Account Managers who are the Owners of their accounts overall, etc. But understand that this has been occurring since June and we are far past it by now.Believe me, no one was more excited than I was to begin this journey with Spinify and you don't know how many times we worked with Spinify to isolate specific calls/emails/opps that were not captured correctly - but in the end, it just does not meet our needs on multiple levels, and took away from my time in being able to actually compete as a team member. Even if we could get the syncing to work, we still have no capability to display the Leaderboards in our area and would lose the entire motivation/inspiration piece that drew us to Spinifyin the first place. We loved the idea of multimedia ways to inspire productivity in our employees. We loved the customizability and the general idea of capturing activities. I appreciated being able to actually put the team member's picture as well as a custom sound file for their achievements. There was a definite uptick in productivity, and it keeps the agents engaged. The visual statistics are rapidly updated and easy to follow for a quick bird's eye view of everyone's progress. We know who is always on the leaderboard and those who rarely make an appearance (and so does everyone else). So, it provides a peer review feedback loop without any discomfort; the stats speak for themselves.The interface is pretty easy to navigate, but the most value we found was the motivational factor it brought to the table. It was such a small addition to the work space, but it made a pretty big difference in productivity. The data is updated quickly and the visuals are appealing and eye-catching. Launch plan: $15 per user, per month. Simple Setup. Setup within minutes no hours. Team Leaderboards. Teams can compete for common goals. 100’s of Themes. Never get bored with the same background again. Celebrate Achievements. Motivate like never before with real time pushes notifications. ChatBot. Exciting new way to talk to setup leaderboards. Gamified . Using points, badges and levels like never before. Below are some frequently asked questions for Spinify. Q. What type of pricing plans does Spinify offer? Q. Who are the typical users of Spinify? Q. What languages does Spinify support? Q. 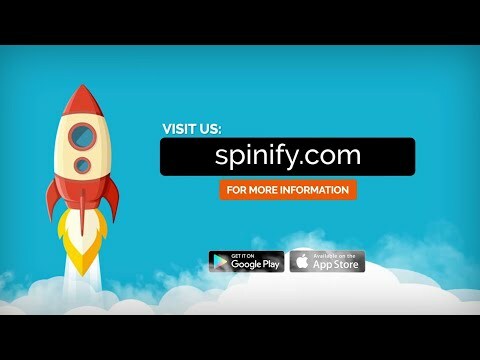 Does Spinify support mobile devices? Q. Does Spinify offer an API? Yes, Spinify has an API available for use. Q. What other apps does Spinify integrate with? Q. What level of support does Spinify offer? Q. Which apps is Spinify compared to most often?